Tummy Time is an important part of your baby’s growth and development. 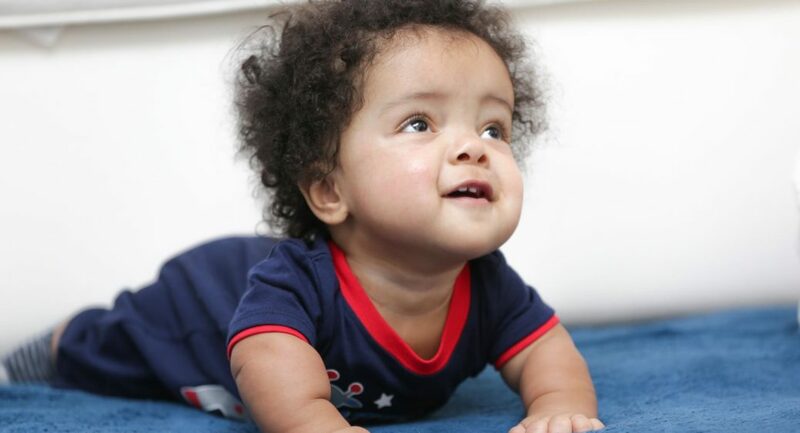 Tummy Time helps strengthen muscles in your baby’s neck, shoulders and trunk. It encourages your little one to look up, left and right. Best of all, it is a great opportunity for you to spend time together. Summit DD works with families throughout Summit County to help them with early childhood learning and development strategies. Here are a few tips from Early Intervention Manager Kathy Supple, to help you implement a successful Tummy Time routine with your little one. Find space. You can begin to introduce a Tummy Time routine to your little one right away. Begin with an open area on the floor. Lay a clean blanket on the floor and place your baby on the blanket on his or her stomach. Start slowly. Begin with 3-5 minute sessions a couple times a day. As your little one gets stronger and more used to the idea, you can increase the Tummy Time sessions and duration (working toward 40-60 minutes daily). Engage. Add favorite toys to encourage your little one to look or reach for them. This helps build strength as well as hand-eye coordination and dexterity. Join them. Now get down on your baby’s level. They are more likely to enjoy Tummy Time if you are there with them. Talk, sing, play! 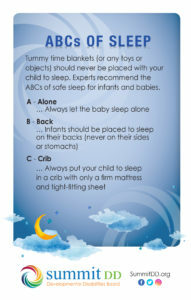 Because the American Academy of Pediatrics recommends that babies sleep on their backs for safety reasons (download our ABCs of sleep graphic), babies need daily supervised Tummy Time to help with their development. Tummy Time helps to build the strength and coordination needed for rolling over, crawling, reaching and playing. to eligible families free of charge, regardless of income.